I recently acquired a smart phone. Since The Upgrade, I’ve been using Apps like a maniac. Words With Friends is like Scrabble. Phrase Friends is like Wheel of Fortune. Aside from the fact that they are FREE, these games are great for staying connected with friends and family living outside your area code!! Good Reads this is where I go when I want to read reviews on books, it also allows me to track what I’ve read by scanning the barcode on the back of the book and better still, I can see what my friends think of books. I love the website, but I kind of love the mobile version even more. “Meet your next favorite book.” Oh Good Reads, I’ve met so many wonderful worlds through you. Teen Book Finder By YALSA This is the latest addition to my App Family. This App has books organized by genre, list, awards, and more. I’m really intrigued by the “Find It” button. Usually my first instinct is to decline when some stalker-app wants to keep tabs on my location. When I granted permission to YALSA it was a huge leap of faith, and I was tickled pink when they recommended a book and then recommended local libraries that have it available. How awesome is that? I’m not putting this App into the MUST download category, but I will admit I am pretty pleased with it at the moment!! Overdrive My absolute FAVORITE book app, however, is the Overdrive App. Overdrive has an agreement with the Chesapeake Public Library so you can check out e-books through the app. You decide how long you want them, and it will return the books for you. Sayonara late fees!! This is one of the library’s best kept secrets!!! In addition to a wonderful array of teen literature, the library has just started adding graphic novels and manga to the digital collection. Do you have a favorite Book/Word related App?? 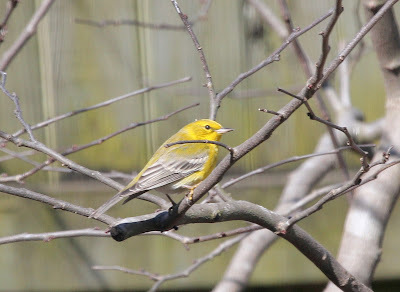 I had an interesting winter in my own yard this year, and I hosted some species that don’t come to my yard every year. Winter birds are far less predictable than breeding birds which remain pretty much the same year-to-year. 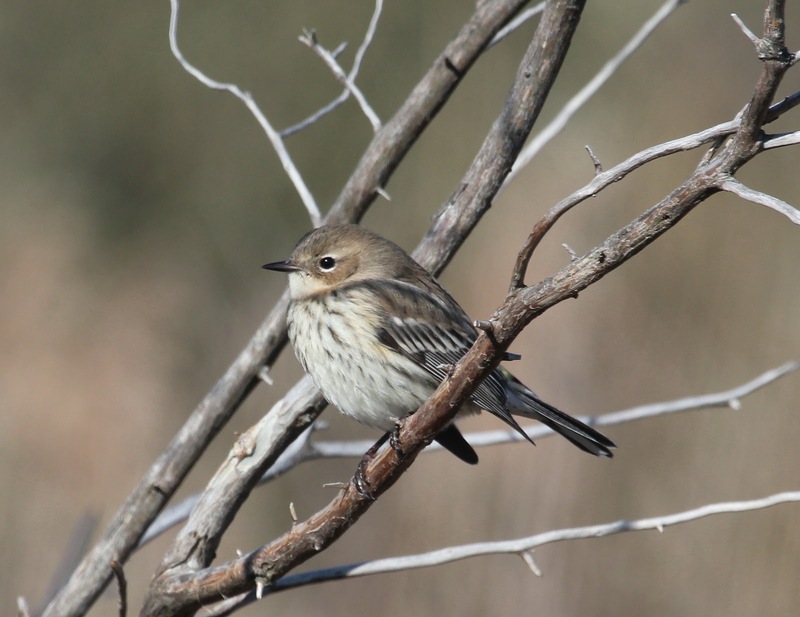 Weather patterns and food sources to the north of us affect bird movements greatly in the fall and winter, and many of the birds we see during those seasons are migrants that do not necessarily return to the same locations each year like the summer breeding birds do. Each day can bring something new and unexpected. My first real surprise of the winter was the female Painted Bunting that visited my yard for a week or so (below). 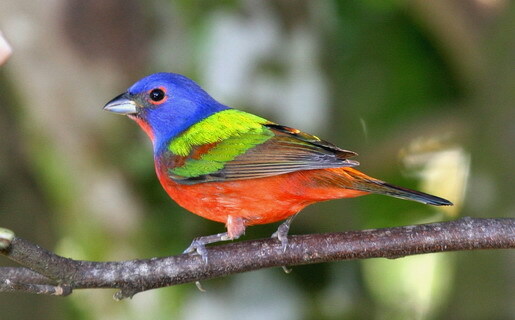 The male Painted Bunting is well known for its bright and showy colors; bright blue, red, green and yellow; the female’s colors are subtle shades of green. Painted Buntings are very uncommon in Virginia, but a few seem to stray here from the southern states each year. 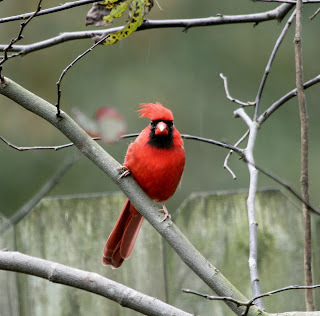 I have seen three or four in my yard over the years, including one gorgeous male. 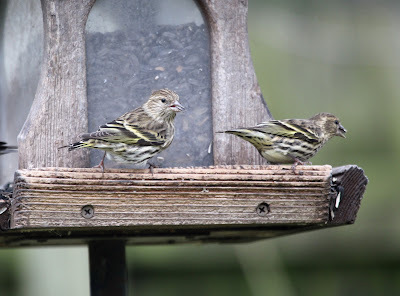 Pine Siskins are little finches about the same size as American Goldfinches, a species that they often associate with in “feeding flocks.” Pine Siskins are a streaky little brown bird with variable amounts of yellow coloring in the wings. 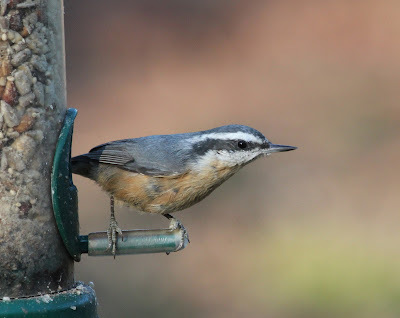 I’ve had anywhere from two to two dozen at my feeders all winter. Red-breasted Nuthatches move through eastern Virginia each fall in varying numbers; the Eastern Shore is a reliable place to find a few. They do not usually stay here or visit our bird feeders, but during irruption years like this one they have been common. They are daily visitors to my feeders. 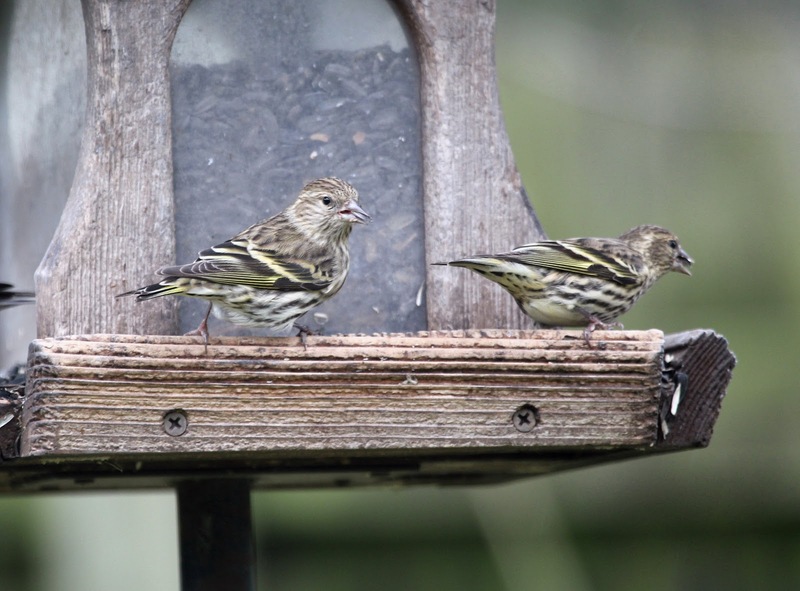 If you keep a feeder, or even if you are just a casual bird watcher, you are familiar with our resident House Finches; the males have red markings, and the females and juveniles are plain birds with blurry brown streaking. 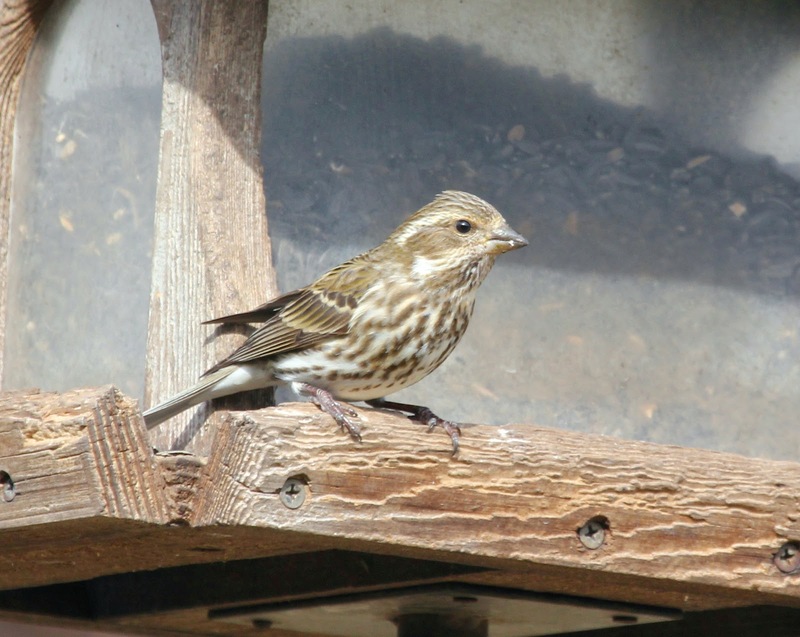 The bird in the photos above is similar to the female House Finch, but is its “cousin,” a female Purple Finch, which is a separate species (note the distinct whitish stripes above and below the bird’s eye; this is a reliable field mark for distinguishing the two female finches). 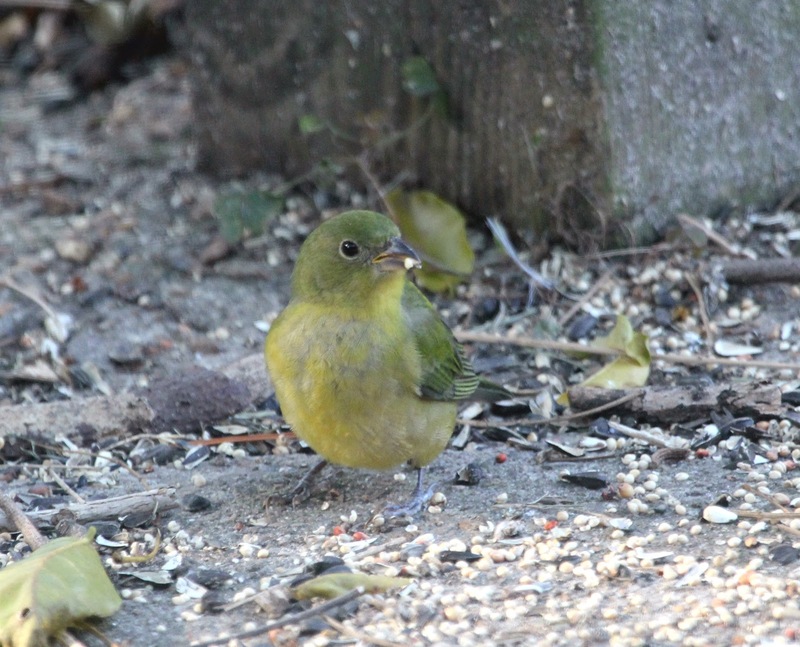 Purple Finches do not breed in southeast Virginia, but a few do pass through during the southbound fall migration (mostly to the west of us), and some visit bird feeders. This is only the second Purple Finch I’ve ever seen at my feeder. Remember this guy? 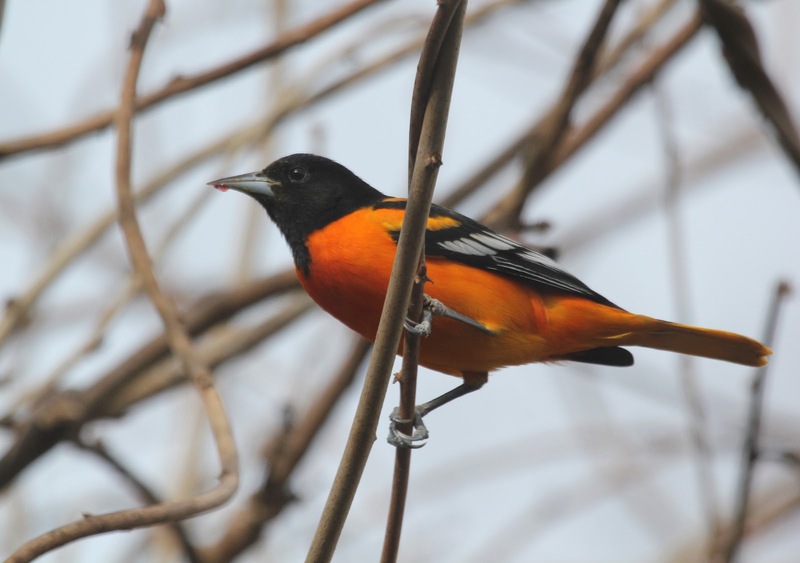 Last year I wrote in this blog about the six Baltimore Orioles that spent the winter in my yard. I had kept a hummingbird feeder filled with sugar water outside during the late fall, hoping to attract a rare winter hummingbird, but instead I noticed one day that a Baltimore Oriole was drinking from the feeder. I knew that Baltimore Orioles love to eat grape jelly, so I immediately went out and bought some jelly and a feeder to put it in. Within a few weeks, I had a total of six orioles, and they spent the entire winter with me, which is very uncommon here. They must have remembered my yard and my grape jelly, because this winter they returned; in fact they added a member to their group. All seven Orioles are still with me as of today. All sparrows look alike to most people — “little brown jobs,” as they’re called. 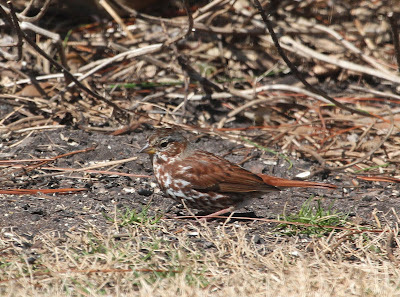 But this one, a Fox Sparrow (above), is special to me. 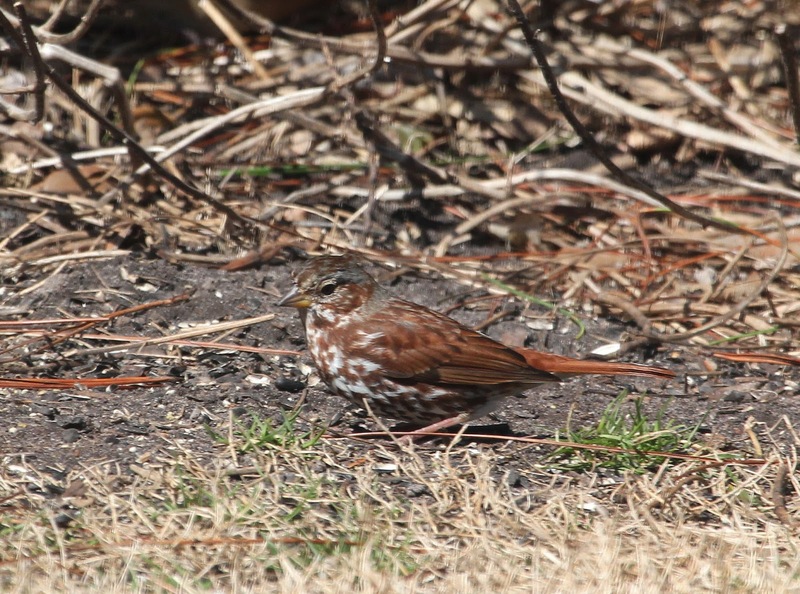 Although this species does winter in our region, it is usually not seen in suburban yards; they prefer woods and unpopulated places. But this one spent two months in my yard this winter. The bird above is also a species of sparrow, although it does not look like most sparrows at all. It is a member of the Towhee family, and this species is an Eastern Towhee. 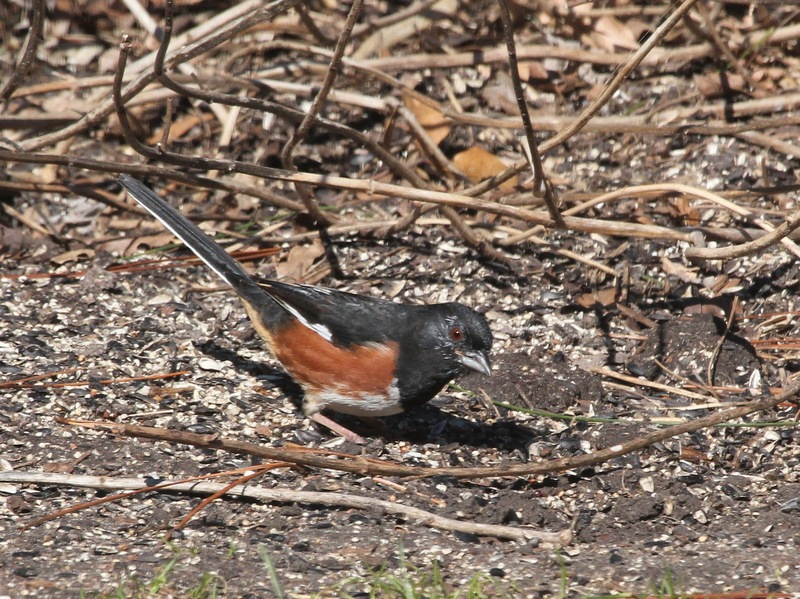 Eastern Towhees are quite common in our area, but for some reason they do not often frequent my yard even when there is free food. This year was the exception, as at least two visit me daily. 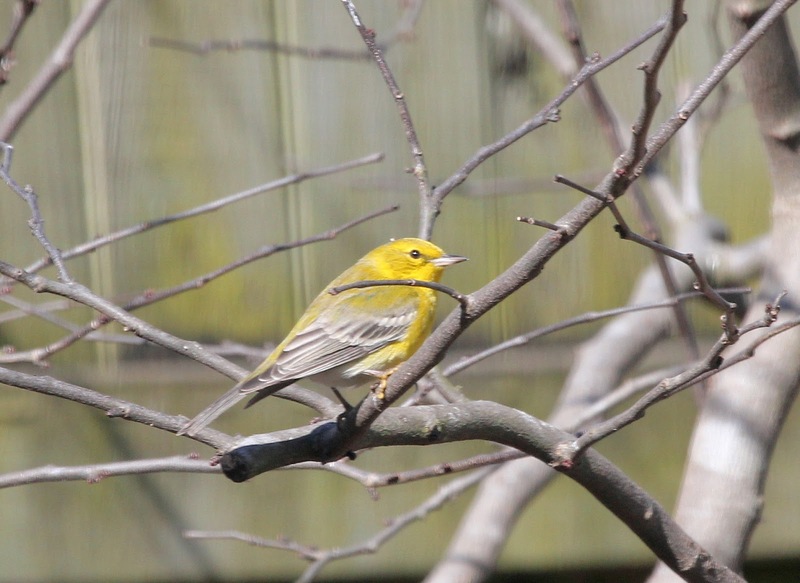 Pine Warblers (above) are a relatively plain member of the Warbler family of birds, but in the winter they bring a much appreciated splash of color to a dreary day. They frequently come to my yard for the suet and nuts that I put out. 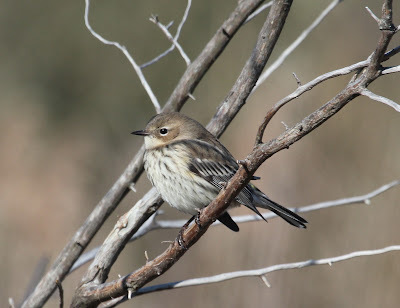 Pine Warblers are year-round residents in southeast Virginia, and one of only two warblers that commonly winter here; the winter-plumage Yellow-rumped Warbler, below, is the other. If you have busy bird feeders as I do, you will eventually attract one or several of the Accipiters, known commonly as “bird hawks.” Accipiters do prey on small birds, and they are often much maligned for this, but they need to eat too and it’s all part of the natural cycle and survival of the fittest. 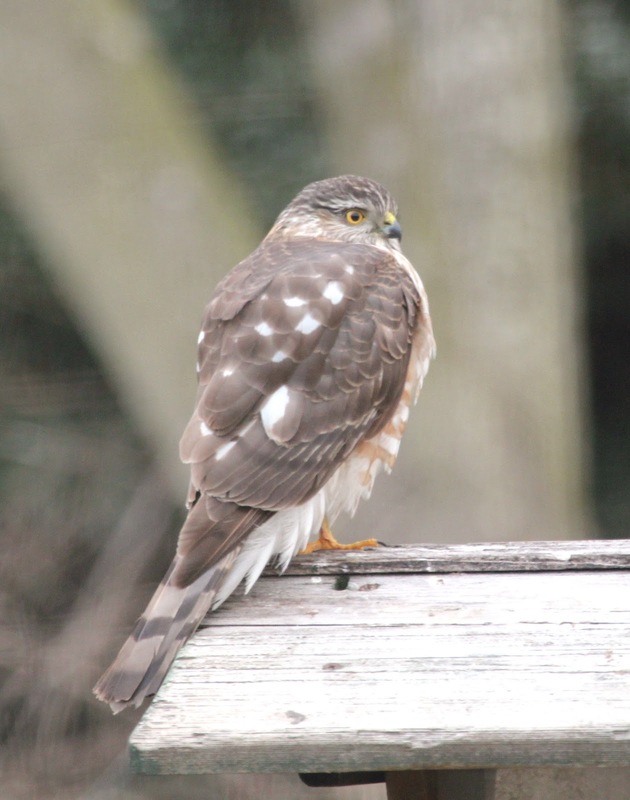 There are two species of Accipiter that you are likely to see in this area, the Sharp-shinned Hawk and the Cooper’s Hawk. 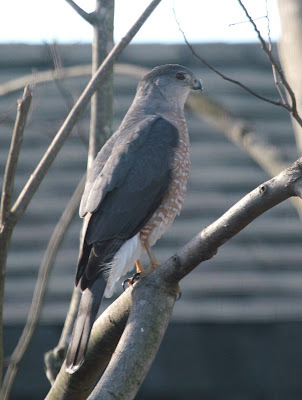 They are extremely similar in appearance, and even though there is an “average” size difference between them, there is much overlap; the average Cooper’s Hawk is larger than the average Sharp-shinned Hawk, but since female hawks are larger than males, a male Cooper’s Hawk might in fact be smaller than a female Sharp-shinned. Confused? Even the most experienced birder can have an extremely difficult time identifying those birds in the overlap range. It takes a lot of experience and familiarity with the more subtle field marks to be able to distinguish these two species. This bird is a first-year, or juvenile, Sharp-shinned Hawk. It is just starting to acquire some of its adult feathers on its breast. Compared to the Cooper’s Hawk, it has a smaller-looking head, a shorter and squared-off tail, and it has a “puffed chest” appearance, seeming to carry the bulk of its weight in the chest. This is a Cooper’s Hawk that is almost in its adult plumage. The Sharp-shinned Hawk will have the same plumage in its adult stage, so don’t try to ID these two birds based on their color; one is juvenile and one is adult. But if you look at the overall “feel” of this Cooper’s Hawk, you can see that its tail is longer than the Sharp-shinned’s and is rounded at the bottom rather than squared. The white tipping on the tail is also more in evidence than it is with the Sharp-shinned. The Cooper’s head is larger in proportion to its body, and the entire posture of the body is just longer. Rather than looking “puffy-chested” like the Sharp-shinned, the Cooper’s seems to carry more of its weight lower in the belly. There are other things to look for when identifying these two hawks; a good website with concise, helpful information is http://www.birds.cornell.edu/pfw/AboutBirdsandFeeding/accipiterIDtable.htm. Next month we will have another Nature Photo Night at the Chesapeake Central Library, so pencil in the date if you’d like to join us: Monday, April 29 starting at 6:00 p.m. Bring about 20 of your nature or wildlife photos on a USB device or a CD, and we will project them onto the library’s movie screen for everyone to view and discuss. All levels of expertise are welcome to come, and if you’d rather just look at the photos than show your own, that is fine too. Give me a call at 757-410-7141 if you have any questions or would like more information — ask for Karen. Hey look at these black dresses!! I’ve read both books and they are definitely worth sharing! In Etiquette and Espionage a rambunctious young teen is sent away to “finishing school” except she discovers that it is actually a school for spies. This isn’t Ally Carter’s Gallagher Girls and it doesn’t follow the usual teen romance triangle plot. This one is unusual, rather original (there are vampires, werewolves, steampunk monstrocities and more) and if that isn’t enough (it should be! )… look at the cover!! In For Darkness Shows the Stars a luddite, anti-technology society has taken over and the main character is the daughter of a prestegious though nearly impoverished family. She could be living in the lap of luxury, she wants to be living with the love of her life, and instead she’s dedicated to running around putting out fires for a family that doesn’t seem to appreciate her efforts. I’m kind of hooked on this story right now, and it isn’t just the pretty cover!! What do you think? Which one would you like to read?